Hi Scott. You may not recall, but I had purchased your piping tutor to start my grandson on the chanter. That was several years ago and Sam in now on the pipes and thanks to your book, has excellent basics. Recently I started my youngest grandson (he's seven) on the chanter, using your tutor. Liam is going great guns and it's because your tutor teaches in such a way that kids learn quickly. I recommend your tutor to anyone starting a child on the chanter. It beats the old way we used to learn. 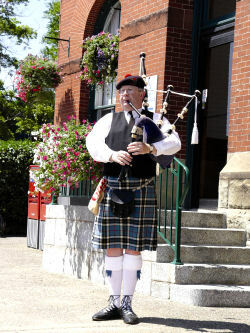 Bagpipes. I just want to thank you. Your book had so many inspiring words in it that motivated my to play and play. I am glad that you, Sandy, and I learned to play the pipes.